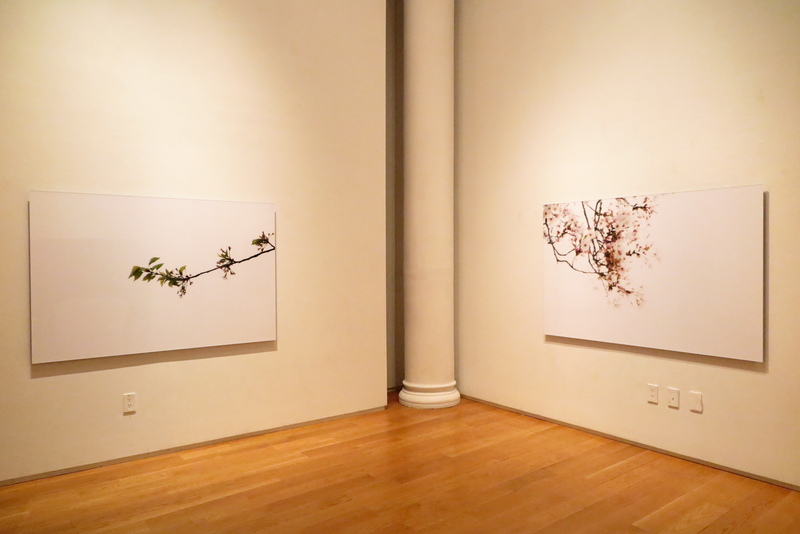 SeongJin An's installation at Tenri comprises photographs of Sakura or Cherry Blossoms. An depicts them in the dusk or moonlight giving them a meditative aura that envelopes visitors in its embrace. The lightness of the cloud-like Sakura are juxtapose against a somewhat dark background. This type of night photography requires high technical skill and is able to create mood depending on the shutter speed, aperture setting, and light sensitivity and requires very long exposures for depth of field quality. It also depends on how high or low the moon is situated because if not at right angle it can result in long shadows or cross lighting. 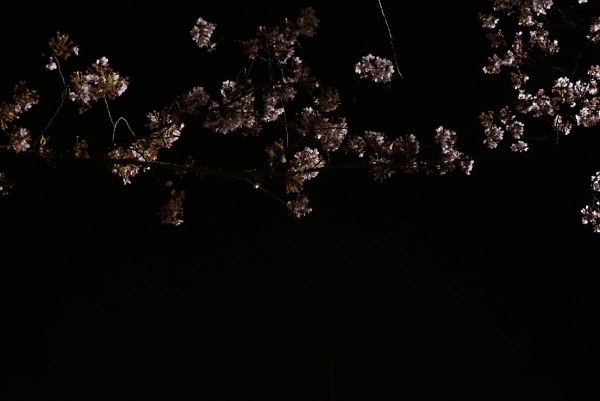 Because An's Sakura blossoms are in moonlight the whole installation creates a mood of melancholy, like a statement about the passing of propitious times. Although of Korean descent, the photographer An lives and works in Japan and is ethically invested in this country's socio-political and cultural fabric. He cares about the preservation of its eco-systems, issues of sustainability, pollution-free energy, green science and worries about the recent rise in peoples' insecurity. In this precarious climate he thinks of a historic Japan known for its blossoming trees juxtaposing it with the recent problems; the Fukushima disaster, social protests, and the high speed of contemporary life. An's idyllic photographs of Sakura blossoms are set against a multi-screen video installation images of modern day Japan in the front area of Tenri. The videos begin with the blossoms slowly blooming, then continue their petals falling while advancing to a faster paced speed that accords with riots, explosions, and in general the disquiet of the present times. These scenes, are concerned with issues with which the Japanese people are faced including the concerted efforts into the containment of the Fukushima nuclear disaster of 2011 knowing that the crisis is far from over. Just recently another radioactive spill took place when a storage tank leaked100 tons of polluted water into the ocean. Moreover, according to a Japan Times article of February 22nd, 2014 "Prime Minister Shinzo Abe has been promoting the export of Japan's nuclear technology as part of the country's economic growth strategy, while domestic opposition to the restart of reactors remains strong." The perceived Japanese homogeneous middle class society of the past is no longer viable in a pluralist era of growing differences as well as the most recent unpredictable state of affairs including that of an inadequate social security system. It is in the youth of Japan that we find the growth of social activism, a break from dominant social norms and the adoption of alternative life styles along with the tendency for cooperation, collaboration, and activism. It is in this spirit that An takes part in the filming of protests, strikes, and other participations in the socio political arena of Japan. 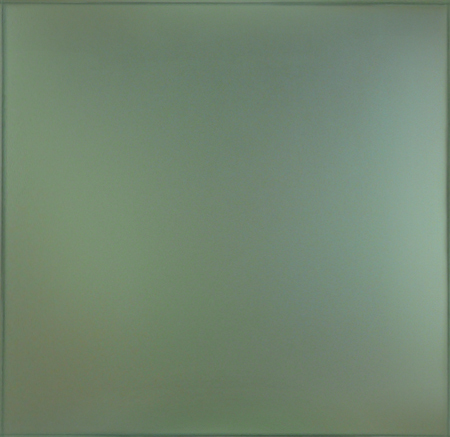 He contrasts these videos sometimes of volatile interventions, against the quietude of his blossoms that offer hope and peace through their lyrical beauty and subtle coloration. Cherry blossoms or Sakura, are a Japanese national symbol and bloom in profusion like clouds but die quickly within a week thus stand as a Buddhist symbol of ephemerality embodied by the concept of mono no aware. Translated literally as "the pathos of things" it refers to the wistful impermanence of life as originally meant by its author Motouri Norinaga of The Tale of Genji fame. As depicted here by An, in their asymmetrical orientation the blossoms partake of the traditional Japanese 'wabi-sabi' aesthetic when compared to the formal Chinese centered compositional organization. Wabi-sabi also relates to an aesthetic about the transience of life and a beauty of austere economy that is ethical and modest. Consequently, it suits An who is also ethically bound to his surroundings while in touch with the idea of life's passing. This type of viewpoint has the advantage of being more suggestive rather than descriptive in its indirect introduction of the blossoming branches emerging from one corner. Its asymmetry has the tendency, in its innuendo, to be more provocative rather than the offering up of the whole scene in a symmetrical design. It may be that in western perspectives we value directness but in art it seems more subtle to pique the viewer's interest. Like many other great artists known for their commitment to the society in which they live, An is interested in seeing the creative side of humanity dealing with its issues. Through his photographs, videos and his written works he calls for a creative solution to social ills such as collusion between government and industry, lacking accountability, and for better written, oral and artistic communication between peoples. An's monumental Sakura photograph formats confront the viewer while surrounding him/her in the softness of their sorrowful beauty. He doesn't hide behind the past, he's not idealizing it, but rather he acknowledges its ephemeral yet cyclical presence in order to move forward creating that rarest of beauty's budding form; art.